raocow, just because a robot is made to do something, doesn't me it "understands" the concept of fate or destiny. Or rather, it doesn't know free will, so, it has no point of reference to know that "destiny" is a thing. 'Rock On' is so much cooler than Mega Merge. Also today was a nice day of helping the people like any good transporter. You did a lot more than I think anyone was expecting you to this time. Good job. You actually got access to a secret, Aile-only reward. If you go back to the girl who you got the Pochette for, I think talking to her repeatedly lets you change her Human outfit color. Vent has no analogue for this. Also since you saved the kids from the fire, if you go back to C-1 and talk to Kenny (kid with purple clothes) inside a building WHILE TRANSFORMED, you can get the ACTUAL reward from that sidequest. Chirei wrote: ↑ You did a lot more than I think anyone was expecting you to this time. Good job. Hey, raocow, you think you could share your save file(Battery or Savestate(in the residential area)) so I can see if I can get Vent with different colors? So now is the time to go do a thing. If you teleport to Area M, you can access Area N. If you go to the end of that area, you will find SOMETHING VERY INTERESTING. You can't possibly miss it, and it doesn't require a specific mission to be active. "Excuse me, I should be allowed to play Kaizo of my own volition and then spend every episode complaining and asking "why did I play this???" while savescumming." Are we going to see raocow vs the arcade tomorrow? LaularuKyrumo wrote: ↑ So now is the time to go do a thing. I think we're saving Area N for post-game content, because that's pretty much what it is. 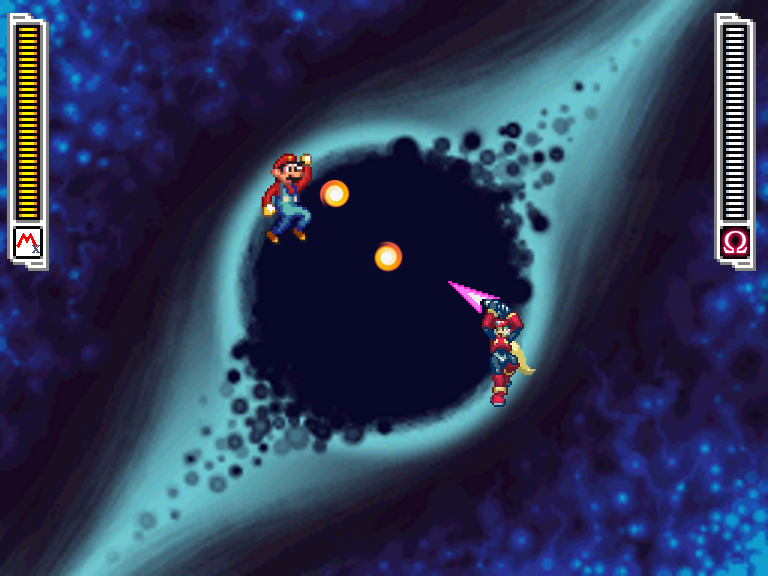 Should we recommend rao do that with both MMZ3 and MMZ4's carts, in addition to doing Omega, because he'd probably find the boss fights fun to revisit with ZX's biometals? Or do you think it'd end up being too redundant? User should really have been banned for this post. PPR, I've missed you. Was this the first PPR appearance in AtMM? I can't remember another. Also I totally never realized you could lift that platform with the tornado, I always got that life up by baiting enemies over and exploiting invincibility frames to wall jump up the spikes. I was always "this is clearly not the intended solution but it works" so I'm satisfied to see what the intended solution is. What are you talking about? Next to a deadly robot is the best place to hide. To use the Mysterious Rock, you have to Talk to Fleuve. I do not remember if you can actually trigger the conversation before you've beaten the game, though. Also the bats come out because the area is Cursed and only attack you when your health is low, to ensure that someone coming out of the Omega fight with 3 lines of health and 0 lives left would have to do the whole thing over! Just a heads-up: You might have to save and reset the game when switching between the MMZ3 ROM and the MMZ4 one. I haven't actually tried this myself, since I didn't get very far in this game. But I have used the GBA slot feature before and it's very simple to use. Anyhow, the reward for doing this is just that it's an alternate way to get the Mysterious Rock, from what I understand. But you'll probably have fun with the process anyways. The background in the Omega fight is seriously the coolest thing. I played this game for the first time such a long time after the Zero series and that flickering callback just made me so happy. Way to Freudian slip yourself with the whole save-state thing, raocow. The trip there ain't that bad, egh? 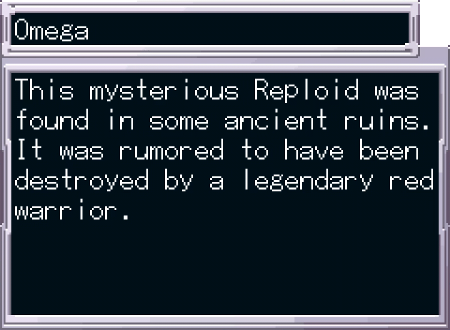 You covered up your save-state checkpoint before Omega with editing.